CH. Fieldfine Winds of Change CD, MH,RN, CGC VC - "Squall"
… much more fitting tribute than Black Ribbon for our “little man”. It is with a very heavy heart that I say we made the decision to let Squall “Ch. Fieldfine’s Winds of Change,CD,RN, MH,CGC GSPCA VC” go to the Rainbow Bridge today. Squall was such a good boy- undeniably the “sweetest” male I have ever known. He loved everyone, he was never a minutes trouble, never complained and always did everything that was asked of him. He loved to run and he LIVED to hunt. If his body could have kept pace with his strong heart and spirit I have no doubt that he would have lived many more years. The almost thirteen years that we had him do not seem like enough, but I could not let him suffer any longer- he was too good a boy for that. He seemed to understand that as I held him and talked to him before we let him go he kissed my face as if to say “it’s OK I am ready to go and I don’t want to hurt anymore.” He never would have complained because he wasn’t that way, but I could see it in his eyes that he was hurting and everyday it took more of a toll on him. 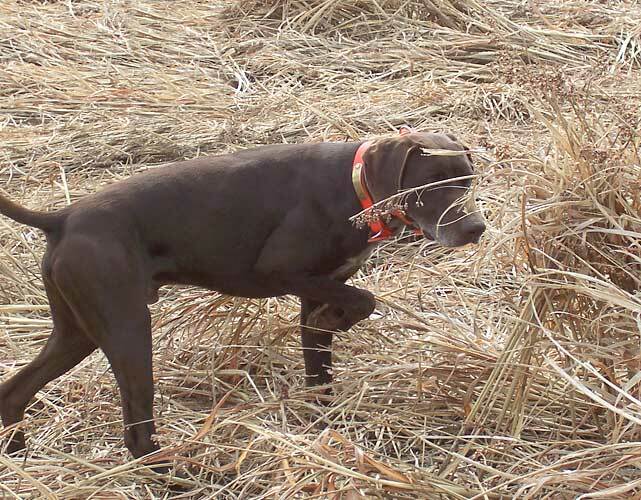 He was our first Fieldfine dog (the start of a great and continuing friendship), our first solid liver and our first REAL bird dog. Squall loved to hunt and if we had realized what we had in that early on I have no doubt that he could have accomplished so much more in the field venues. As it was Squall was content to be shown because I asked him to and he was content to do Obedience and Rally- because I asked him to. So I am glad that he had the opportunity to go with Mike on and off for those two years to explore the “hunting world”. I know he loved it! I know that now he is running like he did when he was young and that there are so many birds and rabbits for him to find. Everyday will be a good hunting day! Good-Bye little “Squirrel” we will miss you! While a part of him will remain here with us it is just fitting that some of his ashes will be spread at the hunt test grounds at McKee-Besher and at Petersburg where he ran and hunted the most. That way when we visit there with our other dogs we know Squall will be watching over us. We are blessed to have had Squall in our lives and are thankful that we have the ability to include him in our breeding program at a later date.